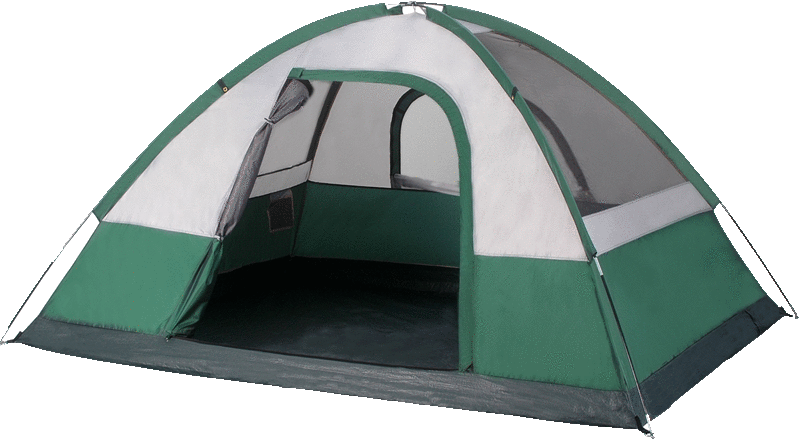 I sat bolt upright in my sleeping bag in the dark of opening day morning. It was 4:30 a.m. and first light was still 2 hours away. A vehicle had just driven by on the road heading in the direction of our hot javelina canyon. This canyon has produced for us for the last three years in a row and we planned to make it four. As far as we know, we are the only hunters who know about this reliable herd. And yet, this herd lives not even a half mile off the main road. When we drove in to the area this year, we headed straight to the campsite that we have likewise been using for the past three years, without any apparent competition from other hunters. This year though, we found another hunting party in the midst of setting up camp when we drove up. This is what must have triggered my paranoia that others may have discovered “our” herd. There is an alternate campsite, actually located closer to the javelina hot spot. It’s just not as nicely shaded. We turned around just past our first choice and headed over to set up camp at the second choice spot. After the vehicle had awakened me, I tried to get back to sleep. I drifted in and out, checking the time again at 5:00 a.m., then 5:30. With sunrise at 7:00, first light would be at 6:30, but somehow in my excitement I had subtracted an extra 30 minutes and started thinking that first light would be at 6:00. So at 5:30 I started getting up, which rousted big son Ben awake. The night before, we had made everything ready to go, so all we had to do was empty our bladders and put on our boots before rolling out in the truck. The parking spot for the pig canyon was only a little over a mile from where we camped. I was very relieved to find no other vehicle parked there! Ben and I had discussed this year’s strategy the night before. Last year’s plan was for Ben to take the first shot, then I would go after the stirred-up leftovers. This year, the plan was to shoot more or less simultaneously, the signal for my shot being Ben’s first shot. This is the plan that worked for us the first year we discovered the herd. We walked down from the truck to follow a ridge, the end of which overlooked our canyon. I stopped at a likely-looking spot to sit down and start glassing. I told Ben to go cover the up-canyon area about 75 yards away. Just before he got out of earshot, I said to him, “Ben, channel three.” He nodded, understanding that I wanted him to turn on his FRS radio when he found a place to sit so that we could talk to each other. Ben gingerly made his way eastward. Our slope was pretty steep. Ben’s path had numerous obstacles such as shindaggers, ocotillos, and large rocks which threatened to roll down the slope with the slightest provocation. He took his time, but finally found a place to stop. The year is 2006, the 100th anniversary of the revered .30 caliber government cartridge of 1906. I thought that it would be way cool to do all of my big game hunting this year with some sort of a .30-06. Some may say that the .30-06 is too much gun for piggies. Well, exactly how dead is too dead? As regular readers know, I really enjoy shooting the old iron sighted battle rifles. 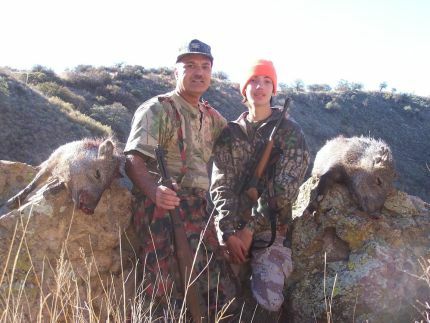 Javelina are the perfect critters for iron-sight hunting because you can usually stalk very close to them. I used a modern scoped bolt rifle last year, and I must admit that it felt somehow unsatisfying. It was just too easy. So two rifles were candidates for this year’s hunt; an as-issued Smith-Corona M1903A3, and my CMP Garand. One of my favorite .30-06 loads is basically an M2 Ball equivalent with a hunting bullet. This is the load I would be using for the pigs, since it should work well in both the Smith-Corona and the Garand. This load throws the 150 grain Hornady SST at 2700 fps when charged with an appropriate quantity of Varget. Varget is a medium burn rate rifle powder. This is an important consideration when handloading for the Garand. Slow burn powders which yield the highest velocities in bolt action rifles are inappropriate for the Garand because they will yield a gas port pressure which is too high. This excesssive pressure will slam cycle the Garand’s action too hard which will lead to bent or broken parts. Testing this load in the Smith-Corona ‘03A3 revealed that with the rear sight all the way down, I was still hitting 2” to 3” high. The only solution would be a taller front sight. I didn’t have time for that, so it was on to the Garand. In less than 10 shots, the Garand was dialed-in to hit right-on at typical javelina distances. The Garand was going hunting! Ben would once again hunt with his TC Contender Carbine in 6.5mm TCU. As a reminder, this is the .223 case necked up to .264. I offered him other options, but he was insistent on hunting with his favorite pig rifle. Ben has put on much height since his first year of pig hunting at age 10. He is 15 now and almost as tall as I am. Two years ago we dumped the youth stock and outfitted his rifle with a standard length stock. Then we equipped it with a Weaver 2-7x32mm scope. What’s new this year though, is his load. When younger, he was a bit recoil-shy, so we used a light load which threw the 100 grain Nosler Ballistic Tip bullet at only 1950 fps. This load was still plenty powerful enough to stop his first pig in its tracks in 2003. One shot, one kill! For this year, we put the pedal to the floor. For H335, Hodgdon recommends a top load of 27.5 grains of powder with the same 100 grain Nosler bullet that we’ve been using. With this recipe we got that Ballistic Tip flying beyond 2500 fps out of Ben’s 18 inch barrel. Ben practiced last fall with the new load, reliably killing eDeers off his shooting sticks at over 150 yards. He’s big enough now that the recoil churned up by this load in the little 4½ pound Contender Carbine doesn’t bother him in the least. I noticed him digging around in his day pack for the radio and for something to eat for breakfast. I turned to start glassing my viewpoint. I was in the area last November also. My whitetail hunt was in this unit. I made it a point though, NOT to visit pig canyon. No need to unnecessarily stir up the herd. On that visit, one day I DID notice a pair of quads parked at the access point. Did they happen to discover the herd? “Uhhh, no … wait, yeah – I see at least one.” The one I saw was about 85 yards down the steep slope toward the bottom of the draw. The grass, bushes and other vegetation was tall enough to mostly hide the short critter. Then I saw another one nearby. I started that way, but still the going wasn’t easy at all. At one point, I rolled a large rock down the slope. Later, Ben would tell me that he saw one pig panic and run when this happened, but at the time, I didn’t see it. As I cut back to the left under the outcrop, I had lost sight of all pigs. I was heading towards another rock on the slope, a smaller, sort-of flat-topped rock big enough for me to sit on. As I moved, I continued making way too much noise. Then I spotted two pigs on the opposite side of the draw on the other slope. Another noisy step-crunch, and the two pigs went into into mild alarm mode. They did a short run, but then stopped and froze trying to figure out what it was that scared them. I reached the flattop rock and sat down. Ben was following behind, and when he reached a bald flat spot on the slope about fifteen yards to my right, I motioned for him to sit down and get ready to shoot. I spoke just loud enough to reach him, “Take the one at the base of the oak tree. Do you see him?” Ben nodded and started deploying his shooting sticks. The two pigs were directly opposite us – they about fifteen yards from each other on their slope, as Ben and I were on our slope, and about 50 yards away from us across the draw. The afternoon before in camp, I messed around with the Garand unloaded, practicing aiming, dry-firing, and flicking the safety on and off. Ben thought that I was just playing around, having fun. Well I was, but really I was re-familiarizing myself with the two-stage trigger pull and the break point. I had never used the safety on the rifle, so I was also developing familiarity with its activation and deactivation as I would be using it in hunting mode. As Ben was setting up his shooting sticks and loading his gun, I settled myself into a comfortable elbows-on-knees seated position. I went off safety and started to aim. Whoa! We were on the sun-drenched south facing slope and the pigs were in shadow on a north facing slope. The sun was still low, and in our faces. I had an incredible amount of glare as I tried to find the pig past the front sight while looking through the glowing rear peep. I could just barely make out the pig. I pulled my face away from the sights a couple of times to verify that I was still aiming at what I wanted to aim at. I did my best to put the front sight on the peccary’s collar, then took the first stage slack out of the Garand’s trigger. Ben yelled back, “I think so.” I watched as my pig rolled down the slope and came to a stop in the thick brush. All of a sudden we noticed the rest of the herd. There must have been near 20 individuals leaving the scene! Pigs that we didn’t even know were there before we fired. “Come on Ben! Let’s go check them out!” I put the Garand back on safe and got up off the rock. We fought our way through the brush and up the opposite slope. We quickly found my pig where I had marked it. The pig was definitely finished, so we headed down canyon toward the oak tree where Ben’s pig was when he fired. No pig. “Cool Ben, where?” The pig was down near the bottom of the canyon below the second oak, less than 50 yards from the shot. It was 7:30 AM, the morning of opening day, and our hunt was over! We moved our pigs onto the sunlit slope for the trophy shot, then took out the knife. This was Ben’s second pig. His last pig was when he was 12. I did the knife work and the body hauling work for both pigs last time, but this time it would be different. I went first while Ben held the legs and assisted. Then we swapped. He did great. Now it was time to bring them up to the road. It’s a tough haul, about 300 feet of elevation gain in about a half mile. I showed Ben the technique I came up with last year of using the shooting sticks to haul the piggy over your shoulder. He didn’t tie his pig tight enough the first time, so when he lifted it up, it slipped out of the noose and hit the dirt. I was getting tired of standing around with my pig’s weight on my shoulder, so I told Ben that I was heading up and that I would meet him at the top. Seriously, I was expecting to have to come back down after dropping off my pig, to help him. Halfway to the truck I stopped for a breather. Imagine my surprise and delight when I spotted Ben coming up the slope behind me, with pig on shoulder! I shouted some encouraging words and continued up to the truck. Only minutes after I reached the truck, here comes Ben trudging up the slope. Back at camp, we hung and skinned them. We finished by lunch. Ben was now a real hunter, having experienced and accomplished the full gamut of a successful hunt. We goofed off for the rest of the day. The next day was spent hiking to the tallest summit in the hunt unit. On the way up the trail, we spotted another hunting party disembarking from our pig canyon parking spot. I watched them for a good long while through binos from the trail until I could see them no more. However, it looked like they did not go in the direction of pig canyon – I hope. It’s funny how hunters can be so close to game and never even know it. Anyways, on previous years, after we had shot into them once, we could never find them again on subsequent days. I sure hope the pigs gave those hunters the slip. All good things someday come to an end. I expect that one of these years, we will see some competition for the herd. I won’t be happy. My peccary paranoia rages on.